Is there an optimal font size / line height ratio? When styling text on web pages, both font size and line height can be set. For example, the text of this post will be displayed using a font-size of 14px and a line-height of (about) 18px, set using the value 1.3em. Looking at other websites, it seems that a ratio around 1.2 is a common practice. What is the best practice regarding this? What are some good resources from which I can learn more on the subject? You want to look to sites such as W3.org for advice on this. Typog­ra­phy ref­er­ences con­sis­tently put ideal line height at 1.2 ems (a mea­sure of type equiv­a­lent to the the let­ter height or point size of a typeface). 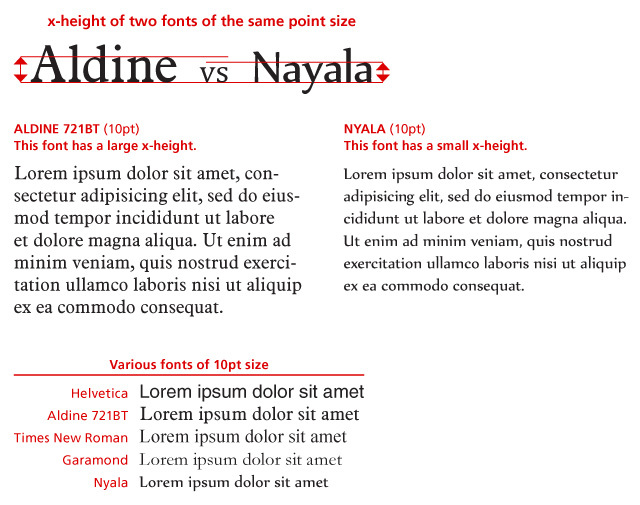 The designs require line lengths (or mea­sure) notably longer than those rec­om­mended in typo­graphic ref­er­ences. The increased line length demands increased line height to aide eye track­ing. Actually, it's subjective, so, for example, Amazon Kindle let you choose line height from a number of variants (and will increase spaces between paragraphs respectively). I think this is influenced by personal preference and the width of the block of text. The wider the block of text, the bigger the line-height should be in order to keep your eyes on the same line while reading it. Personally, I like the line-height to be 1.5em or 1.6em. This Interactive Guide to Blog Typography has a section about line-height which also suggests a line-height of 1.5em. Unfortunately, there's no single value of line-height (leading) that is optimal for all situations. An optimal range is probably roughly 1.3–1.7, but to select an optimal value requires we look at the specific font in use and the width of lines of text (among other things). Leading (or line-height) is the amount of vertical space between lines of type. The default leading in page layout programs is usually sufficient but there are a few factors that may require it to be adjusted. A font may have long ascenders and descenders that touch each other between lines of type, causing a distraction. If a font has a high x-height, it reduces the negative space between lines of type that gives the illusion of tight leading. Tight leading makes it difficult for the reader to find the start of the following line of type which is particularly noticeable in long lines of type. Therefore, for wide columns of type, a generous line height results in better readability. For body copy, I usually set the leading so that the height of captital letters fit perfectly between lines of type, which is around 1.5 times the font size. Your leading should increase proportionally to your Measure. Small Measure, less leading. Wide Measure, more leading. It’s a simple but effective rule. As you can see, it's impossible to choose a single optimal line height. Rather, you must primarily consider your font's x-height and the length of lines in your text. Be sure to read Alan Gilbertson's excellent answer to a very similar question on the Graphic Design Q&A site. Unfortunately, just knowing the optimal line height for a given font size is not enough. All 3 typographical dimensions—font size, line height, and line width—affect one another. Therefore, you cannot talk about line height or font size without also considering the line width. Based on this reasoning, there must also be an optimal line width that corresponds to the optimal line height from the equation above. Problem is, you don’t know the exact relationship between line width and line height. All you know for sure is that the line width is significantly greater than the line height. With the help of basic mathematical modeling, you can make an educated guess that the relationship between the optimal line height and line width is exponential. Please refer to this article: http://uxdesign.smashingmagazine.com/2011/11/29/the-perfect-paragraph/ - a very interesting one, describing also some other aspects of text on websites. Please do remember that it always depends on the device as well, due to resolution, screen size and the distance from which user is viewing the screen (significantly closer in case of mobile phones than in case of desktops, while using a smaller screen). RWD (Responsive Web Design) is crucial here. I find this article by information architects inc. very interesting. According to it (cf. section 3) 1.4em is a good value for legibility. Most of the answers I see here are geared more toward print than the web. Reading printed materials is different than reading on the web. As far as text sizes go, instead of using fixed font sizes, you should always let users decide with defaults they have set in their browsers. 1.5 is a good, readable line height when reading text on a screen. This makes it easier for people with sight impairments who use screen magnifiers to read the content on your site. When web developers go against the web standards, they make it harder, if not impossible, for some people to navigate their sites. There are many folks who have different abilities who use assistive technologies to experience your sites and adhering to web standards ensures these folks can actually use your site. People access and use the web in many different ways and going against the standards not only makes you look like a hack that doesn't know his/her craft, but you also narrow your web audience, and really, isn't the purpose of being on the web to reach the widest possible audience? Very good example to see the difference between all values and why is prefered to use a number value. In my opinion, I prefer to use between 1.5 to 2 because providing spacing between 1.5 to 2 allows them to start a new line more easily once they have finished the previous one. Not the answer you're looking for? Browse other questions tagged accessibility html legibility font-sizes or ask your own question. Line Height and space between paragraphs? How to check correct font size?